The webserver is disabled by default and has to be manually enabled by the user. This can be done in Settings → Services → Control → Allow remote control via HTTP. The settings allow to specify a custom port number and an optional username and password for HTTP's Basic Access Authentication. Furthermore a Web interface can be chosen which will be used when accessing the webserver without any specific path. To set a web interface add-on as the default web UI, go to System -> Services -> Control and select that add-on for the Default value. Then go to the hostname (or IP address) of that HTPC+Port number. Note: Some platforms use port 80, which is the assumed port if no port is given in the address. 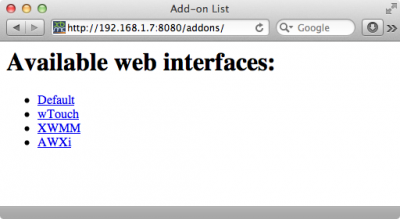 Let's say http://123.4.5.6:8080 is your local IP for accessing your default web interface add-on. You can access the other web interface add-ons you have installed by going to http://123.4.5.6:8080/addons/ where you will see a directory listing. This page was last edited on 10 July 2018, at 11:58.